This week, I’m going to try you out with an experiment. You will need a piano. Here’s what you do. First of all you need to play a top D quickly and repeatedly. After a few seconds of that you need to play the following chord (while keeping the top Ds going): C, D#, F#, A#, C four times in the following pattern: long long short long. The question is…where are you? I’m prepared to bet that a good majority of people hearing this piece of ‘music’ will know exactly where they are: a railroad crossing in the United States of America. It’s so familiar because it’s a staple of TV programmes and films. Nothing says you’re in the rougher end of an American town than the mournful wail of a locomotive horn in the background. You only have to hear the ding-ding-ding of an activated railroad crossing to know that a train is on the way (see Back to the Future part III) and that quite likely there’s about to be a car/train near-miss or crash (see Super 8 or Unstoppable). Indeed, TV series Nashville managed to create a night-time suicide attempt at a railroad using apparently nothing more than sound effects and a bright light pointing into the camera. Imagination did the rest, and that’s the cultural power of the sound of American railroads. There is nothing that brings home the fact that you’re on holiday in America more than lying awake in a hotel room in Buffalo (New York) and hearing the cries of freight trains on the tracks, several miles away. That’s my experience, anyway. So what makes the sound of an American railroad crossing and the trains which use it so distinctive? Firstly, the crossings themselves have bells, unlike the electronic sirens more commonly heard in Europe. 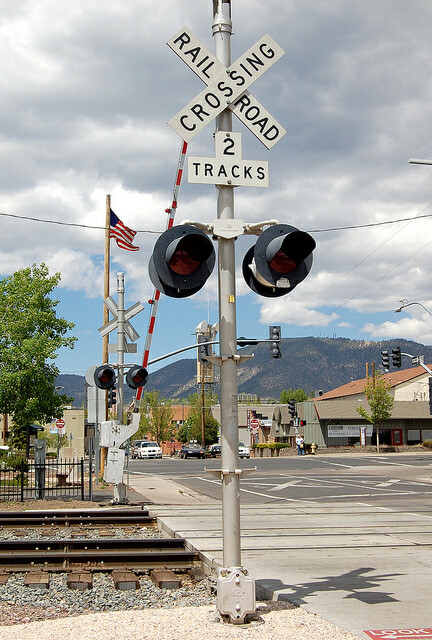 Until recently, railroad crossings had actual bells mounted on top of the poles which also carry the warning lights, as you can see on this website. Modern technology means that mechanical bells are no longer used, but rather than moving to sirens, the Americans have gone with an electronic unit that still produces a bell sound, although purists say it doesn’t sound anything like as good (see here, for instance). I don’t know about that. They sound OK to me. American train horns are also something rather special. American readers might or might not know that in the UK our train horns are two-tone (one high note, one low, produced by two horns of slightly different sizes), generally described to children as making a “nee-nah” sound (“choo-choo” is for when we’re doing steam train whistle noises). They’re loud enough to make you jump if you’re not expecting one as a train draws into a station. They are, however, completely outclassed by America train horns, which make a sound best transcribed not as nee-nah, but as BWWWWOOOOAAAAARRRR BWWWWOOOOAAAAARRRR BWOAR BWWWWOOOOAAAAARRRR! In place of the two horns of a British train, American locomotives have a supersized five. They are epically, stupendously, loud. Watching (and hearing) one or more big modern American locomotives traversing a railroad crossing at the head of one of their incredibly long freight trains is one of the great transport experiences. It’s a teeth-shaking, bone-jarring, chest-hammering, ear-thudding attack of noise, and if Armageddon ever arrives in railroad form I strongly suspect that’s exactly what it will sound like. I discover that the distinctive long-long-short-long blast of an American train horn is actually mandated by the Federal Railroad Administration (see here), a level of state prescription I completely failed to anticipate in a country with the suspicions of big government that America harbours. I further discover that not all five-chime horns (as they are called) are the same. 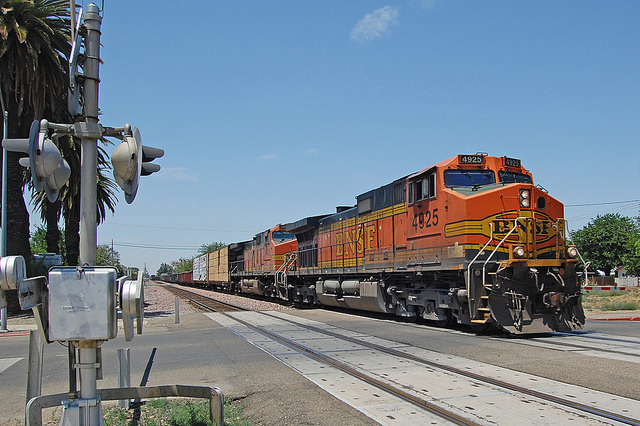 Freight operator BNSF, for instance, uses Airchime K5HL horns on its newer General Electric locomotives which produce the following notes: C, D#, F#, A#, C, those in the piece of piano music at the beginning of this article. Because the world wide web is a truly wonderful thing, you will not be surprised to hear that there is a website dedicated to American train horns, from which I was able to learn the chord that BNSF locomotives play. Amtrak locomotives, however, use Airchime K5LA horns to play a slightly different chord: D#, F#, G#, B, D#, which sounds slightly sweeter to my untrained ear. 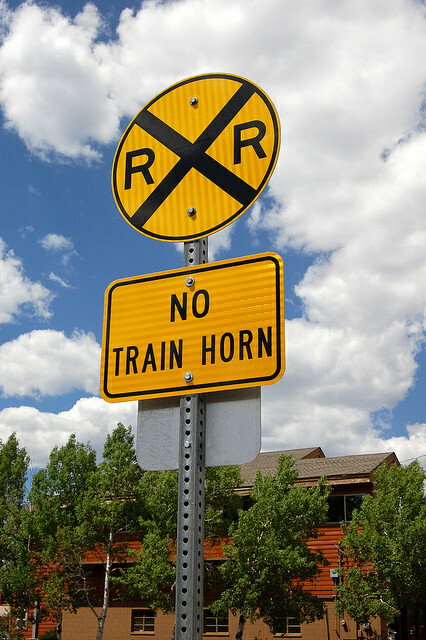 You can find out more on the Five Chime Consultants webpage, where the authors also suggest that mounting railroad horns on your own vehicles is emphatically not recommended on noise grounds, although I know that people do. The mournful sound these horns produce is deliberate. The notes are designed to sound “wrong” when played together, the sort of thing that would make you wince if you heard it in the middle of a piece of music. That’s deliberate, because such atonality attracts attention, which is exactly what you want a train horn to do. The fact that quite a lot of people actually like the sound of train horns (albeit in the distance; you wouldn’t want to be next to one for too long) and find them a soothing sonic background, is an unfortunate aberration. Train horns are one of those things which really rile up non-appreciators of railway sounds. Way back when I worked in local government in England we suddenly started getting a lot of complaints about train horn noise in about 2003-04. This coincided with the replacement of ancient trains in the south-east of England dating from the 1950s and 60s with brand new ones. In the intervening time, on-track equipment used by rail workers had become louder, and workers’ ear protection equipment had become better at blocking noise. The old trains had horns which, frankly, you’d have been hard pressed to hear on the other side of a crowded bar. The new ones, however, were up to modern standards and were a lot louder, leading to the complaints. I must admit that I was and still am of a mind that if you move into a house next to a railway, you’d better expect a degree of train noise, and you shouldn’t assume that just because your trains are currently ancient and their horns are quiet(ish), they always will be. I also have a degree of sympathy for track workers, who I think do a hard enough job as it is without trains carrying under-powered horns creeping up on them. So I’m afraid I paid very little attention to the complaints I got. Several other local authorities, however, were more responsive to their complainants and did kick up a fuss via their duties on noise pollution (pffft). The issue gained substantial media attention with various threats of court orders for noise abatement and the like. As a result, the rail industry got RSSB (the Rail Safety and Standards Board) to look into train horn noise, and RSSB eventually published some revised working practices on train horn noise in 2006, including a night-time “quiet period” from 2300-0700h when trains no longer sound their horns routinely at ‘whistle boards’ (signs which tell drivers to sound their horn because there is an at-grade crossing ahead). It also mandated a maximum train horn loudness of 106 decibels (with a minimum of 101). This would seem only a little lower than the 110 decibel maximum of an American train horn (set by the Federal Railroad Administration), except that decibels are based on a logarithmic scale, in which a change of just three decibels means the sound is twice as powerful, assuming I understand the sums right. So American train horns being about four decibels louder, and therefore more than twice as powerful than British ones seems about right. Now I discover that the problem of train horns annoying residents seems to have spread to the US. BNSF has felt the need to explain on this webpage that its drivers have to sound the horn approaching any crossing. The Federal Railroad Administration has introduced the concept of Quiet Zones in which train horns are not routinely sounded at railroad crossings (though they might still be in emergencies), and has resources to allow towns to apply for such zones (see this webpage). I’m not sure at all about this. I’m sure it’s much nicer for the immediate neighbours of the railroad line, but American locomotive horns have worldwide recognition and cultural significance. As I said, I like hearing the train horns wailing away in the early hours. It seems such a shame to ban them. It manages to go right through an eight-note musical scale of the do-re-mi-fa-sol-la-ti-do sort made famous in the 1965 film The Sound of Music (dir. Robert Wise), before going on a few more notes and then falling flat on the eleventh. Considering that The Sound of Music is set in Austria, it’s somehow appropriate that it’s Austrian state railway operator OBB’s Railjet Tauruses which have become famous for this trick. Sadly, the latest versions of the Taurus no longer use GTO thyristors, so the singing Tauruses are destined to remain in a class of their own. We have level crossing bells in Sweden. Also Finland. There are a lot on Youtube. Thank you – I do like a level crossing with a bell! I see a theme emerging – perhaps a post on platform announcement tones. Is the SNCF announcement https://www.youtube.com/watch?v=EIMT7JImkHc the pinnacle? Would anyone care to suggest any other worthy jingles/sonic design at transport operations? I’m always up for suggestions, though sonic design is particularly hard to research so it might take me a while! The ScotRail class 380s also have a strange ‘whistling’ sound as they accelerate/decelerate – its a cross between a door warning chime and a UFO sound effect! Apologies to anyone confused by a rogue “MAKE PUBLIC” comment in the original text of this article. As you’ll probably have realised, it was a reminder to myself to check that the YouTube video was publicly accessible, a reminder which I completely forgot to remove before the piece went to press….all tidied up now. Thank you to everyone for the comments on this piece too, it’s interesting to read your thoughts. Ah, the Br 1016/1116! I lived for almost 12 years in Austria, right behind the railway station of Villach. In summer, with all windows open, the nights were sweetened by their tune. Sadly, the whole region was (and still is) totally paranoid with respect to noise pollution. What a pity. Dan you may have already come across Steve Reich’s composition Different Trains, quite a demanding listen in some ways that reflects on the implications of train journeys before, during and after the Second World War and won a Grammy in 1989. The three movements include both European and American train whistles and horns and this wikipedia entry https://en.m.wikipedia.org/wiki/Different_Trains mentions describes briefly some of the musical differences between the two. And you can find clips on YouTube and hear that evocative horn sound. Enjoy! Nice post from the Brit point of view. Like the train whistle, railroad men in America are a breed unto their own. Quiet, unassuming with a quirky humor. They love beer and pretty woman only second to their job. God bless ‘em all!